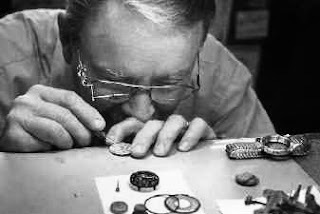 My Dad worked for more than 40 years as a watchmaker. Sitting at his counter in an old pharmacy in the Spokane Valley he made time. Replacing batteries, fixing old pocket watches and telling corny jokes to the customers who came to know and love him, he made a life and a career of helping others mark the passage of time. On a recent visit home I sat alone in the living room where I grew up listening to time moving on. In a watchmaker’s home time is everywhere. The grandfather clock. The anniversary clocks. The various watches and timepieces, seen and unseen, all keep score. Everything appears to be ticking. Every counter, cabinet and hutch a resting place for a clock, watch or time piece. Periodically, chimes and bells create a stir noting another milestone. Sitting there I was struck by how important time is to all of us in our jobs. In my own career, time is a yard stick of success; time to implement, time to resolution, or time to value all measure our performance as a team. Across the customer journey we measure our success against the clock and, though less obvious than that constant tick-tock of home, it is always moving forward. While there are a seemingly endless number of ways that we are impacted by time in Customer Success one measure stands out in my mind. Time to value is more than just a measure of the days from signature to business outcomes. It is a measure of the partnership and the organization’s effectiveness in delivering on a commitment to the customer. From the customer’s perspective it is an important milestone. As a sponsor of the software purchase, time to value can be validation of a smart decision or a red flag that will require explanation. At both HireVue and Kahuna I was supported by tremendous Customer Success Business Analysts, Dave Andreasen and Blake Schiafone, respectively. Their data analysis showed us that there are many elements which contribute to revenue retention and account growth. Some indicators are intuitive like Net Promoter Score and Referenceability. Some indicators are less intuitive but equally important and correlated with retention such as participation in marketing events and utilization of Support (interestingly no utilization of support is more concerning than high utilization when it comes to predicting retention). The analysis also showed that time to value is an excellent predictor of customer retention and a leading indicator of success. Customers that successfully adopt the product immediately after go-live, and according to plan, have a higher likelihood of long term success and realization of value. Through further analysis we were able to define this adoption curve as a success trend line and map new customers against it to know whether we were off to a healthy start based on time to value. We leveraged this insight to drive improved customer retention by incenting our Professional Services team not just with launching customers on time (time to implement) but on the pace of product adoption post go-live. This incentive took the form of a quarterly MBO, one of several key objectives, that measured PS performance based on customer product adoption 90 days post go-live against the adoption curve that we had validated as an indicator of success. Through work with Brett Hart, at the time HireVue’s Director Sales Enablement and Solutions Consulting, and a fantastic ROI software solution provided by theROIShop, our Customer Success Team leveraged that same ROI calculator that was delivered Pre-Sales to ensure that the customer’s value realization was meeting or exceeding the commitments made during the Sales process. Combined, these initiatives had the effect of helping us proactively drive time to value by focusing on the time component (how fast the customer adopted the product) and the value component (did we actually deliver the committed and agreed value as measured by ROI). While it is not always as obvious as a ticking clock in a room full of timepieces, the time to deliver business outcomes for customers is constantly slipping away. Time to value can be an important predictor of customer retention and a leading indicator of success. By aligning the Customer Success team with Sales on the points of value and the expected return on investment for the customer and incenting the services team to drive to outcomes, not just go-live, you can ensure that time is well spent.